He says… She says… Two complete novels! Witches and warders and werewolves and more! Jane Madison: A librarian who finds out she’s a witch. David Montrose: A warder who juggles work, warfare, and protecting Washington’s witches. Jane tells her story in Girl’s Guide to Witchcraft. Then David gives his own—very different—view of those events in The Library, the Witch, and the Warder. Together, these two complete novels bring you surprising perspective on exactly what happens when the strongest witch in Washington refuses to be controlled by the man who is charged with keeping her safe. A little romance… A lot of magic… And a cameo appearance by some hipster werewolves… Discover the paranormal power behind the scenes in the nation’s capital! 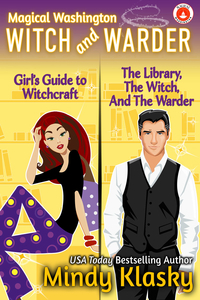 Magical Washington: Witch and Warder is available as an ebook.